This time of year is easily consumed with the smells of Autumn: apples, pumpkins, cinnamon, nutmeg, pine cones and wood fires. Even if the cool temperatures have yet to show themselves in Southern California, fall is here. Changing leaves, crisp fall air, migrating honking geese, and jumping into piles of freshly raked leaves may seem foreign to many Angelinos, but pumpkin is here to remind us it is indeed October. I love this recipe because it is fast to put together (basically put it all in a blender) and the resulting custard pie has a delightfully mellow taste, unlike the countless slices of sweet pumpkin pies we are all likely to eat closer to Thanksgiving. The texture is softer than a traditional pumpkin pie AND you can skip the crust and save yourself a few calories. Place all your ingredients in a blender/food processor and blend until smooth. Butter a 9 inch round pie plate or a cast iron skillet. Optional: Sprinkle pumpkin seeds over batter. Bake for 15 minutes, then reduce heat to 375°F and bake for another 10-12 minutes or until the center is set. Optional: once completely cooled you can dust with powdered sugar. 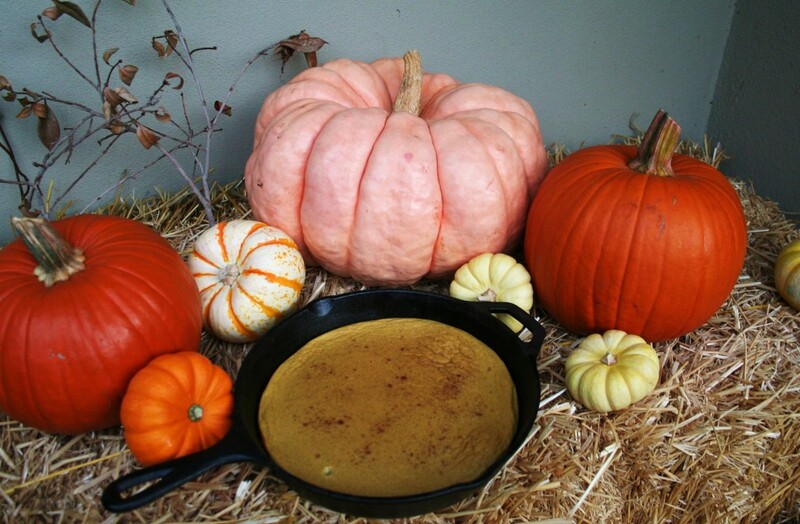 For a fun and sweeter treat, bake off your pumpkin custard in ramekins for special single serving. Sprinkle with turbanado sugar and place under your broiler for a few minutes for a quick brûléed pumpkin custard. Finally, top with a dollop of whipped cream.